The proteome represents the total complement of proteins present in a complex, an organelle, a cell, tissue, or an organism. Proteomics encompass the multifaceted study of protein expression, interactions, posttranslational modification, and function at the cellular level. Mass spectrometry offers significant opportunities for the analysis of single proteins and the unbiased large-scale analysis of proteins in complex mixtures. The ability to conduct large-scale investigation of proteins in an unbiased fashion dramatically improves the opportunities for biological discovery and is relevant for the elucidation of novel biological insights into physiology and disease. In this regard, mass spectrometry is considered a key technology that will drive the achievement of several milestones in the identification of key proteins involved in disease detection and treatment. 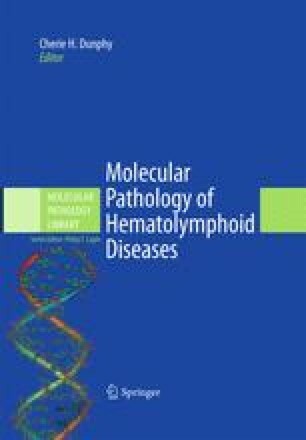 This chapter provides a synopsis of the principles of the techniques employed in the current state-of-the art proteomics and the opportunities that this suite of technologies offers in biological discovery as it relates to human lymphomas. Advances in mass spectrometry-based proteomics have shifted the paradigm of translational cancer research (for a review of background on proteomics and mass spectrometry see). The achievement of the ultimate goals of identifying biomarkers for diagnosis and prognosis and the development of novel agents for therapy will require significant effort in understanding the basic protein building blocks and the global proteomic circuitry.